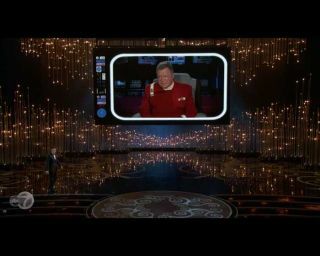 William Shatner beamed in to help Seth McFarlane with the opening number at the Academy Awards last night (Feb. 24). "Star Trek" fans got quite a treat last night during the Academy Awards last night (Feb. 24). "I've come back in time from the 23rd century to stop you from destroying the Academy Awards," joked Shatner to McFarlane. Actors Chris Pine and Zoe Saldana also had a part to play in the festivities. Pine, who plays Kirk in 2009's "Star Trek" and its sequel "Star Trek Into Darkness " being released later this year, and Saldana, who plays the Enterprise's communications officer Uhura, recapped an earlier event they co-hosted on Feb. 10 called the "Sci-Tech Oscars." The newest movie in the Star Trek franchise, "Star Trek Into Darkness," is set to be released on May 17.